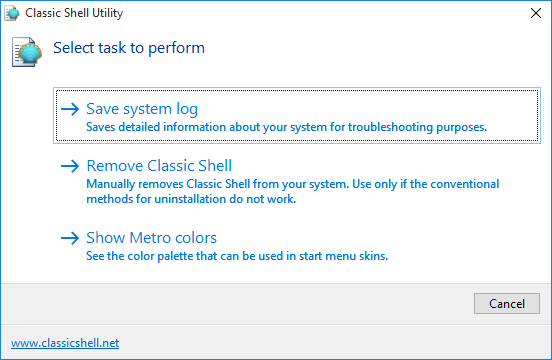 To troubleshoot Classic Shell installation or uninstallation process, there is a separate tool called Classic Shell Utility. It can create troubleshooting logs, remove your Classic Shell settings or completely erase all traces of Classic Shell from your system. It also has a feature to show the Metro color palette for creating skins. For those who are having problems uninstalling or upgrading Classic Shell, the feature to remove Classic Shell from your computer in case the normal uninstall process doesn't work can be useful. The utility will manually delete the installed files and will repair the registry. There are options to keep or delete all your settings. 4.3.0 doesn't work with Win 10 build 1703. The utility is no help. It's time for a new version. What exactly doesn't work for you? I don't know about StrongThanDirt but I have the problem that the "most used apps" menu is and stays empty (that's the one you see when open the start menu with the "all apps" entry at the bottom) after you upgrade to Windows 1703. A simple uninstall and reinstall doesn't solve the issue. I didn't tried the Utility yet. If you install Classic Shell after a) upgrading to 1703 or b) doing a fresh installation of 1703 including it's first cumulative update it works as intended. That cumulative update somehow breaks something. Nevermind. Just found viewtopic.php?f=7&t=7477. Will try it on Monday. I'm also using insider Windows 10 build 16251. When at build 16199 Classic Shell worked just fine. When build 16251 came out, Classic Shell stopped working. several times, and it loads, but goes into the loop. In almost all cases like this it was caused by the IDT audio control panel. It is not compatible with Windows 10. See if you have a file named "idtnc64.cpl" in C:\Windows\System32, and if so, delete it. Thanks Ivo, I had that file and deleting it helped. Bloody Windows 10. I just want to upgrade from 4.2.5 to 4.3.1. Can I just uninstall 4.2.5 thru Windows, or is it better to use the Utility?